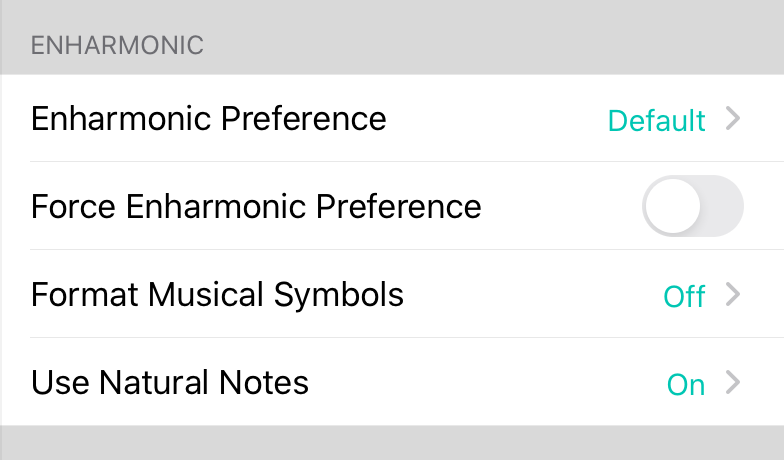 Default allows OnSong to determine the best enharmonic preference to use for each key. Default. Flat uses the flat symbol when required in a key where the enharmonic preference is unknown. Sharp uses the sharp symbol when required in a key where the enharmonic preference is unknown. When this setting is enabled, the enharmonic preference is used regardless of the transposed key's enharmonic preference. For instance, if you transpose into the key of D, but have this enabled and the enharmonic preference se to flat, then F# will be outputted as Gb. Off will not reformat any symbols keeping text or symbols as encountered. Default. Text converts any sharp or flat symbols to the plain text version like "#" or "b". Symbol converts any plain text version of sharp or flat to symbols like "♯" or "♭". Localized changes sharp and flat symbols to language specific variations. For instance in German, this will convert G# to Gis and Gb to Ges. Some musical keys that contain a number of sharps and flats may begin to use notes like B#, E#, Fb and Cb. By default, OnSong will replace these non-standard notes with natural versions such as C, F, E and B. Default is on.